The Miniature Pinscher (also known as the �MinPin� or �MiniPin�) is a German breed; �Pinscher� is German for �Terrier�. The Miniature Pinscher does not descend from the Doberman Pinscher; this is a common mistake because the Doberman was introduced first to the U.S. 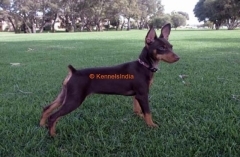 The Miniature Pinscher is actually the older of the two breeds and is the likely source breed for the Doberman. The Miniature Pinscher descends from the German Pinscher, from whom it derives its black and tan coloring, the Dachshund, from whom it derives its courage and red coloration, and the Italian Greyhound, from whom it derives its playful demeanor and graceful gait. The earliest evidence of the Miniature Pinscher is a painting from the 1600�s of a small red dog similar in appearance to the MiniPin. The Miniature Pinscher was originally bred for small size, which resulted in a less appealing appearance than today�s dogs. The Miniature Pinscher�s popularity in its native Germany dipped in the early 1900�s; its survival was mostly due to Miniature Pinschers which had been exported to the U.S. prior to World War I. The Miniature Pinscher was recognized by the American Kennel Club in 1929 and is today one of the most popular toy show dogs. The Miniature Pinscher has a shoulder height of 25-30 cm (10-12.5 in) and weighs 4-6 kg (9-13 lbs). Miniature Pinschers have a wide muzzle, narrow head, and erect ears, which may be cropped. They have small, round �cat feet� and an erect tail which is usually docked. The Miniature Pinscher has a smooth, graceful gait. The Miniature Pinscher has a smooth, short, lustrous coat which can be red, stag red, chocolate with tan markings, or black with tan markings. Some standards allow blue and fawn. Miniature Pinschers are alert, bold, spirited and lively. They are extremely energetic; some consider them to be the most energetic of all breeds. Miniature Pinschers are known to act far larger than they really are. They are eternal puppies. The Miniature Pinscher is fearless and loyal, with strong guard and protection instincts. The Miniature Pinscher prefers to let its owner know when it wants to be handled; if it feels pestered it may bite. The Miniature Pinscher gets along fine with children, provided it is not pestered by them, in which case it may bite. Small children should be cautioned and supervised to protect the dog from injury. Some Miniature Pinschers are aggressive with other dogs and strangers, but this behavior is not common if proper socialization has taken place. The Miniature Pinscher is easy to groom; it requires only a periodic brushing to remove dead hair. Miniature Pinschers are not well insulated against the cold. Due to the MinPin�s vermin hunting instincts, small objects such as bottle caps can present choking hazards. Miniature Pinschers are prone to obesity; proper nutrition and exercise are important. The Miniature Pinscher has a lifespan of 12-14 years. Training for the Miniature Pinscher must be consistent. The Miniature Pinscher is eager to learn and obeys commands fairly quickly, but it can also be stubborn. As this is a working dog, it is best not to spoil it, as this increases its willfulness. Miniature Pinschers are difficult to housebreak. The Miniature Pinscher needs regular opportunities to exercise as it is extremely energetic. Most of its needs can be met through indoor play. The Miniature Pinscher is well suited to apartment life.